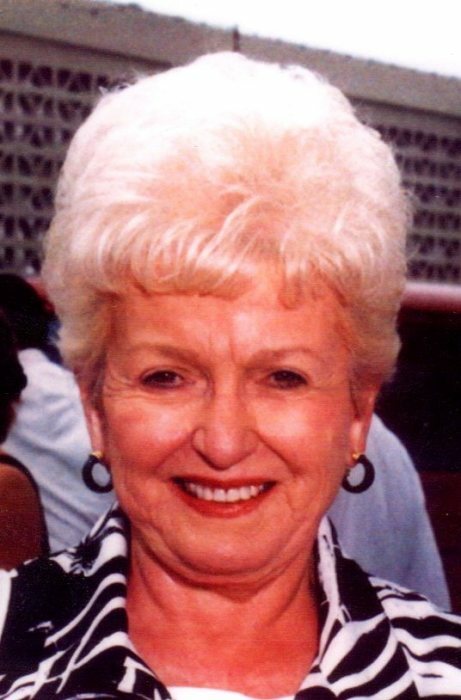 Emily Ann (George) Chambers of Neenah passed away peacefully on Friday, December 7, at the age of 88. The daughter of Henry and Bernice A. (Brosnan) George was born July 10, 1930 in Chicago IL. They welcomed beloved brother Henry W. George in 1940. Emily was a proud graduate of Presentation Grammar School, Chicago, and Oak Park IL High School. After stints at the candy counter at the Symphony Theater in Chicago's Austin neighborhood, the notions department at Marshall Field's Chicago State Street store, and as a Girl Friday at a LaSalle Street law firm, Emily joyfully married James J. (Jim) Chambers at St. Catherine of Siena Church, Oak Park IL on September 30, 1950. After their brief honeymoon and U.S. Marine Corps service at Camp Lejeune, NC, son Michael was born in 1951. Twins Catherine and Thomas arrived in 1954, and James, Jr. was born in 1960. The family moved to Neenah in 1967, just in time for the famous Packers ice bowl game. Sundays at the Cecil Street homestead were reserved for Emily’s Italian family dinners. Many holidays were enjoyed there. Jim and Emily were boating enthusiasts, owning several different vessels while enjoying cruising the Wolf River area. Emily was a productive contributor for nearly 18 years in the accounting department of Kimberly-Clark Corp.'s Neenah South plant and was an avid fan of thoroughbred horse racing, the Chicago Bears, and the Green Bay Packers. She was able to enjoy the warmth, golf, dining, and entertainment lifestyle of Palm Desert CA for nearly two decades before returning home to Neenah. Emily was an enthusiastic supporter of Angel View charities of Palm Springs and the Best Friends Animal Society. Her precious felines Steve and Eydie have already been adopted within the family. Emily was preceded in death by her parents and her husband of 43 years, James J. Chambers (1929-1993). Emily is survived by her brother: Henry W. George (Patricia Fritsch) Las Vegas NV; her children: Michael Chambers (Yvonne Kehl) Kimberly, Catherine Bradley (Dennis) Oshkosh, Thomas Chambers, Chicago, James, Jr. (Kathy) Village of Harrison, and dear family friend Barbara Chambers, Neenah; her grandchildren: Heather Larson (James), Daniel Chambers (Kathy Madden), Autumn Hill, Timothy Bradley (Sarah), Tony Bradley (Laura), Zachry Chambers and other relatives and friends. Emily enjoyed the youthful exuberance of her great-grandchildren: Jimmy and Madeleine Larson, Kasey Chambers, Nikki Ryberg and Jenna Madden, Rebecca Bradley, twins Nathan and Clayton Bradley, Oz and Samantha, nephew Jorey Basinger and great niece Sofia Basinger of Fairbanks AK, and four great-great-grandchildren. The family wishes to thank the care teams at Island Shores Independent Living in Neenah, Theda Clark Hospital, and Oakridge Gardens Senior Living Facility in Menasha. Funeral services will be held Saturday, December 15 at Kessler Funeral Home, 304 S. Commercial St., Neenah. Visitation will be held from 9 a.m. to 11 a.m. with the funeral service at 11 a.m., burial at St. Margaret Cemetery and a luncheon following at Kessler Funeral Home. A memorial has been established.